The below chart is an updated version of a chart I’ve posted before. 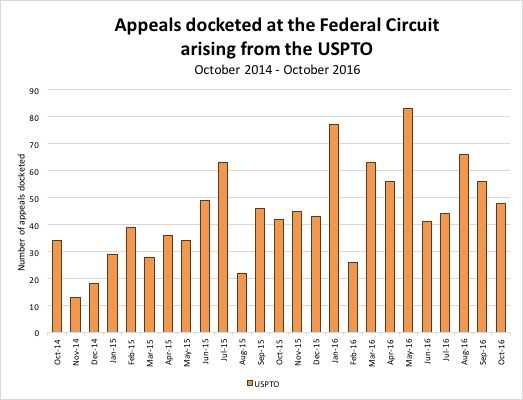 It shows the annual number of appeals docketed at the Federal Circuit per fiscal year (which runs from the beginning of October to the end of September. Changes over smaller periods of time: To get a sense of whether appeals from the PTO are continuing to rise, I created a chart of the number of appeals arising from the PTO on a monthly basis. Although there’s substantial month-to-month variation, the overall trend for the last year does not suggest to me that the appeals from this source are continuing to increase. However they remain at a much higher level as compared with the period before 2014. 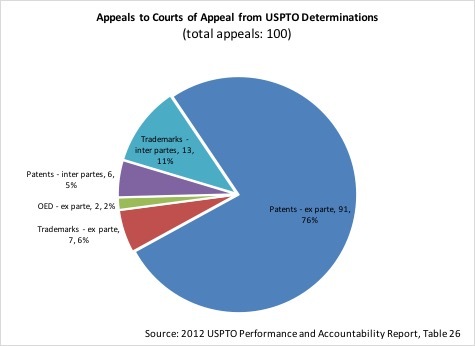 Makeup of appeals arising from the PTO: Using data from the USPTO’s annual Performance and Accountability Report, I constructed the below pie charts to illustrate how the composition of appeals from the PTO has changed over the last several years. These graphs provide a vivid image of how dramatically that composition has changed in a short period of time. 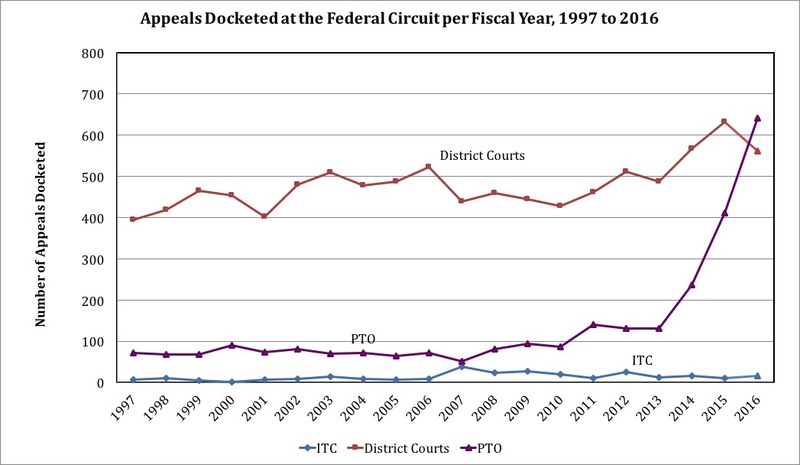 Note that this data is not an exact reflection of the appeals that reach the Federal Circuit due to a few limitations in the underlying reported data. In particular, there are a handful of appeals (my understanding is <10) that might be counted in multiple years due to the way the data is reported for 2016. In addition, the data is reported for all appeals to federal appellate courts, not just appeals to the Federal Circuit. Due to variations in appeal pathway, a handful will end up in the regional circuits (especially trademark cases for which review is sought in the district court. Pro-Football v. Blackhorse is an example). What will the future bring? Going forward, I’d expect the number of appeals arising from the PTO to decline to some—but not a great—extent. 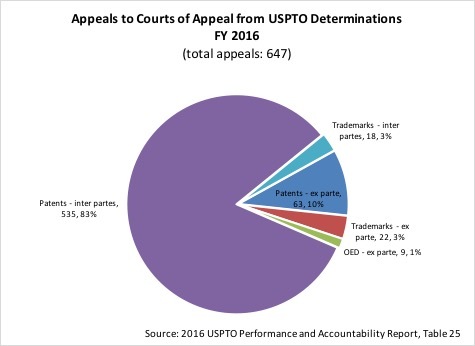 Data from the USPTO’s annual Performance and Accountability Report indicates that the number of newly filed inter partes review proceedings has remained roughly constant over since 2014, with 1310 cases filed in FY 2014, 1737 cases filed in FY 2015, and 1565 cases filed during FY 2016. (Source: USPTO Performance and Accountability Reports, Table 15). Since most of the appeals are from inter partes review proceedings (as there are relatively few of the other types of inter partes proceedings), a modest decline in the broader pool will likely result in a modest decline in the subset. In addition, as attorneys obtain greater information about the probability of outcomes at the Federal Circuit, it is likely that appeals will fall as parties choose not to incur the expense of an appeal, at least in cases at the extreme. Sitting in the background is the Supreme Court’s parallel copyright decision in Petrella v. MGM (2014) holding that the doctrine of laches cannot bar a claim for legal damages brought within the three-year statutory limitations of copyright law. In its opinion, the Federal Circuit distinguished Petrella – finding that in this situation patents should be treated differently than copyrights. According to Black, the focus should be on the statute – and the statute does not provide for laches. Further, section 286 is entitled “Time Limitation on Damages” — that is the section that should be applied when determining whether a patentee unduly delayed its enforcement. Mr. Black: Laches has never been applied in the face of the Federal statute of limitations. The Court looked at that issue exhaustively in Petrella and could not find Respondents one single example. Mr. Waxman, representing the accused infringer in this case (who won on laches) began by highlighting the background of the 1952 Patent Act — “This Court has repeatedly recognized that the 1952 Patent Act sought to retain and reflect patent law as it then existed.” And, at that time (1952), laches was thought to be an available defense. Mr. Waxman: The question in this case is what Congress understood the patent law doctrine was in 1952. And we think that there is a literal mountain of cases. Every single case that was decided in any court at any level from 1897 when the six-year damages cap was put into place until today, with the exception of one district court decision in Massachusetts which demonstrably misapplied the two authorities that it cited, every single case has recognized that — that laches was a defense in an appropriate case to claims for damages. And no case has ever said or suggested to the contrary. CHIEF JUSTICE ROBERTS: That mountain of cases were in equity, right? . . . that’s where your mountain becomes a mole hill, right? . . .
Mr. Waxman: But the point I’m trying to make — and if I make no other point, please let me not be misunderstood here — Congress in 1952 simply continued in haec verba the statute that had existed on the books since it was put in on the equity side in 1897. And there were — whether it is a mountain, a mole hill, or a mesa, all of the — okay. Never mind. I’ll just stick with mountain or mole hill. All of the — I mean, I — I don’t think — I hope I live long enough to have another case where I can come to Court and say, all of the case law that decide — that examine this question, all of which was adjudicating the applicability of laches to claims of damages alongside the six-year damages limitation provision, all of them recognize that laches existed comfortably alongside that provision. And there is nothing really anomalous about that. The difference then, according to Waxman, between patents and copyright is not really found in the statutory text itself but instead emanates from the history and congressional sense at the times of enactment. For patents, the background law allowed laches and congress intended to implement that background law in 1952. So it was in front of Congress in 1952 with three things. This Court’s precedent that said that laches could not be used to bar legal relief. You had the merger of law and equity in 1938 which scrambled all the eggs. You had the 1946 Lanham Act, which also went through the committee on patents and copyrights where they specifically included the word “laches” in the statute. And you had the abolition of the remedy that parties had been seeking as the primary means of monetary relief in patent law for 60 years. There is no way that you can look at that, that fact, and get around it by pointing to a book, a treatise, which, by the way, does not have a section in it on unenforceability. Although I continue to cringe at the prospect of no appeal, the decision here makes logical sense based upon the statutory and procedural structure. Here, the termination decision was based upon the petitioner’s failure to identify all real parties at interest — a core requirement of a complete petition. Base upon that failure, the Board determined that the petitions were incomplete and therefore “cannot be considered.” With that conclusion, the Board terminated the petitions and vacated the prior institution decisions. In this framework, it makes sense for the termination/vacatur to be a decision on institution and thus not subject to appeal. I could imagine a different scenario where the PTAB terminates an IPR based upon some other ground that is not a petition requirement — such as failure to prosecute or improper post-institution attorney conduct. In that hypothetical situation, the termination would be substantially divorced from the institution and – in my view – would no longer fall under the no-appeal requirement. An additional difficulty with all of this stems from the pending Ethicon petition and the difference between action by the Director and action by the PTAB. The statute separates the roles – indicating that the PTO Director’s role is in determining “whether to institute” an IPR. 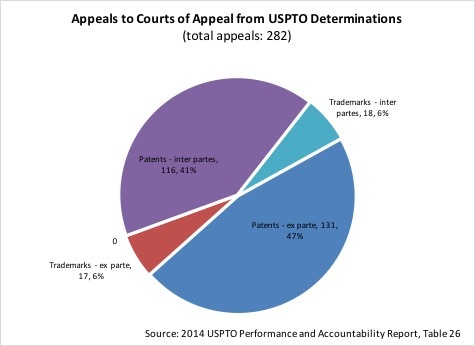 Under the statute, the PTAB then steps in to conduct the trial. Those separate roles were then combined by PTO regulation which states “The Board institutes the trial on behalf of the Director.” 37 CFR 42.4. A question – unanswered in this case – is whether the Director’s regulatory delegation above should be interpreted to also extend to vacating and terminating petitions. I’m not sure that it does. Crouch, What Powers Can the Director Delegate to the Patent Trial & Appeal Board? Crouch, Due Process and Separating Powers within an Agency. Crouch, End of the Road for Ethicon’s Anti-Delegation Argument? Whether the [AIA] permits the Patent Trial and Appeal Board instead of the Director to make inter partes review institution decisions. The setup: The statute requires “The Director” to “determine whether to institute.” 35 U.S.C. 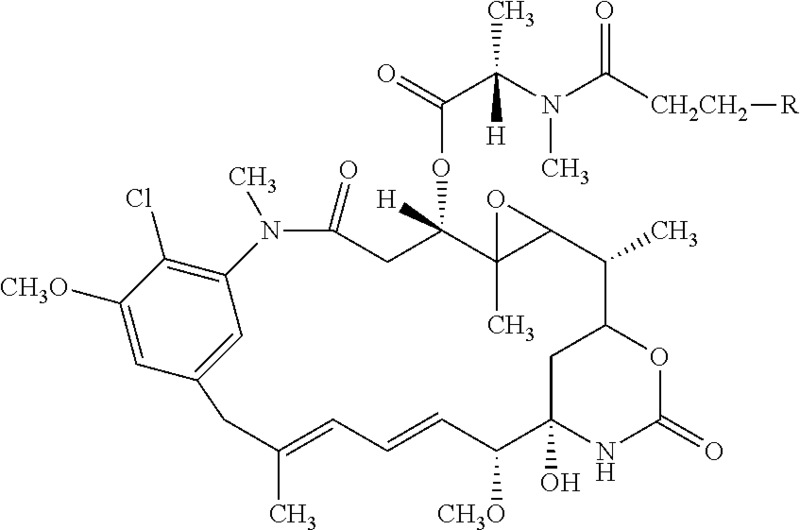 § 314(b). Under the statute, the PTAB picks up its role after institution in order to “conduct each inter partes review instituted under this chapter,” § 316(c). Rather than making the determinations herself, the PTO issued a rule that the PTAB makes the institution decisions “on behalf of the Director.” 37 C.F.R. § 42.4(a). Although the statute does not expressly prevent the Director from delegating her authority, Ethicon argues that the statute should be interpreted in light of the “longstanding policy of separation-of-functions whereby adjudicatory officers inside an agency (such as administrative law judges or, here, administrative patent judges) are insulated from discretionary executive functions.” Of course, the Director does not have to personally do all the work – The idea here though is that it is impermissible to delegate policy issues to the administrative patent judges. And, the AIA is clear that the institution decision is at least partially based upon policy and institutional competency determinations. 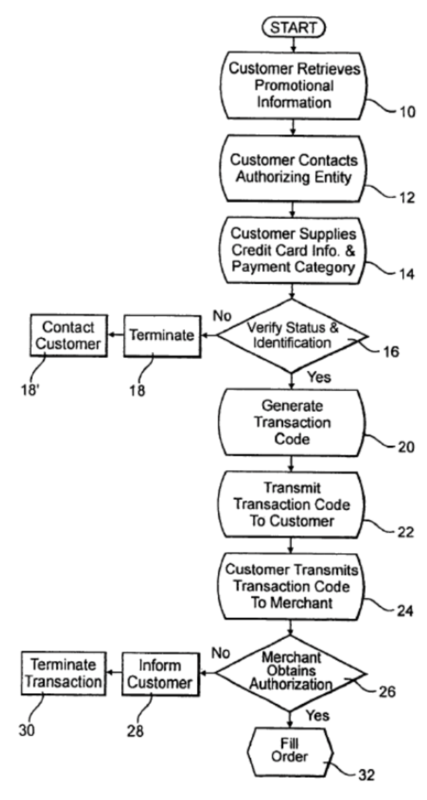 In the background, patentees see the separation of institution from trial as a mechanism for getting two-bites at the apple.